The Public Employees Benefits Board (PEBB) and the Health Care Authority (HCA) want to encourage us all to strive for improved wellbeing! In doing so, PEBB and HCA have offered a comprehensive wellness program to all benefit eligible faculty, staff, and hourly employees. 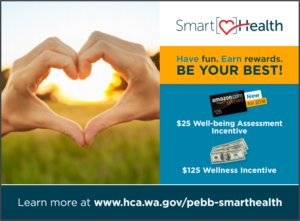 SmartHealth is Washington State’s voluntary and confidential wellness program. This interactive web program helps you take steps to improve your health and wellbeing, while having fun and connecting with others online. You can earn SmartHealth points by participating in activities throughout the year; points earned between January 1 and September 30 are used to establish eligibility for the next year’s wellness incentive. A $125 incentive by then participating in and tracking wellness activities throughout the year. A one-time deposit of $125 into the subscriber’s health savings account (if enrolled in a PEBB consumer-directed health plan). Create your account at the SmartHealth website. Complete your wellbeing assessment (required to earn the incentive). This will automatically earn you 800 points, as well as the $25 Amazon gift card. Complete activities of your choosing, and record your progress throughout the year. Once you reach 2,000 total points, you will become eligible for the incentive. Eligible employees covered by a PEBB medical plan can participate. If an employee retires, separates/resigns, or goes on Leave Without Pay, and are not enrolled in Medicare Part A and B, they will be able to continue to participate in the program. Spouses or registered domestic partners can participate in SmartHealth activities, however, only subscribers are eligible to receive the financial incentives. Participation is completely voluntary. If you do not participate, you will not be eligible for the wellness incentives. When is my deadline to earn the incentive? If your start date is prior to June 30, you have until September 30 to earn your points. Those hired between July 1-August 31 have 90 days to earn their points, and those hired September 1 or later have until the end of the year. What tracking devices can I sync up? There are a variety of apps and devices that track your activity and report the minutes, miles, steps, and calories burned. Some of these apps and devices track your activity for an entire day (such as a pedometer), while others track your activity per session. Read the description for each option on the SmartHealth website in the “Apps & Devices” section in “Settings” for more details about which units they measure and how your activity is tracked. To find out more information or to purchase an app or device, click the connected devices icon on the SmartHealth website. How do I know if I’ve received the incentive? The SmartHealth website will do all of the tracking for you, and once you’ve reached 2,000 points, you will be eligible. Can I use SmartHealth on my phone? Yes! You can access the SmartHealth website from any computer, tablet, or smartphone. Why are only certain activities worth points? The SmartHealth website offers a variety of activities, however, only certain activities are worth points in any given time frame. Please check back every few weeks, as the calendar will rotate and new activities will become eligible for points. Can I participate in SmartHealth when I’m at work? You can, provided time spent doing so is deminimus. Governor Inslee will allow state resources, such as your computer, to be used while participating in SmartHealth. Please be mindful that completing the actual activities (like walking or meal planning) should be done on personal time. Will my health information be kept confidential? Yes, due to the Health Insurance Portability and Accountability Act (HIPPA), all information, including assessment results and activity data, is kept private. Data will be aggregated and reported for PEBB members as a whole. Please contact the SmartHealth Customer Service line at 1-855-750-8866. Hours of operation are Monday through Friday, 7 a.m. to 7 p.m.
How frequently should I log my activities? You will want to log your activities as frequently as possible, and at least once per month. Many activities will allow you to log several weeks of back history at any given time, but you will most likely not be able to log data from more than a month ago. For questions concerning the website, please contact support@limeade.com or call 1-855-750-8866, Monday through Friday, 7 a.m. to 7 p.m. You can also contact HRS at 509-335-4521 for any general questions concerning eligibility or the incentive requirements. Visit the Health Care Authority Website for more SmartHealth information and resources. Is my PEBB medical plan health assessment required for SmartHealth? You will not earn any SmartHealth Points for completing your Uniform or Kaiser Permanente Health Assessments.